If you are among the many people who experience dryness of the scalp or itching and flaking, try oiling your scalp with vitamin E oil for immediate relief. I began using vitamin E oil after hearing a stylist say that he applied it to the scalps of clients who were suffering from hair loss. He literally bought vitamin E capsules, broke them open, and applied the oil directly to the hairline of clients whose hair was thinning near the temples. 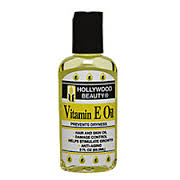 I figured trying it couldn’t hurt, so I headed down to Sally’s Beauty Supply and purchased a bottle of Hollywood Beauty Vitamin E oil for less than three dollars. While using vitamin E oil to promote hair growth I discovered that it also stopped my scalp from itching.